Meanwhile down the pub someone told me about their ancient “Cosim” sailplane vario and the way it integrated total energy using a pitot pressure and carefully calibrated air leaks. 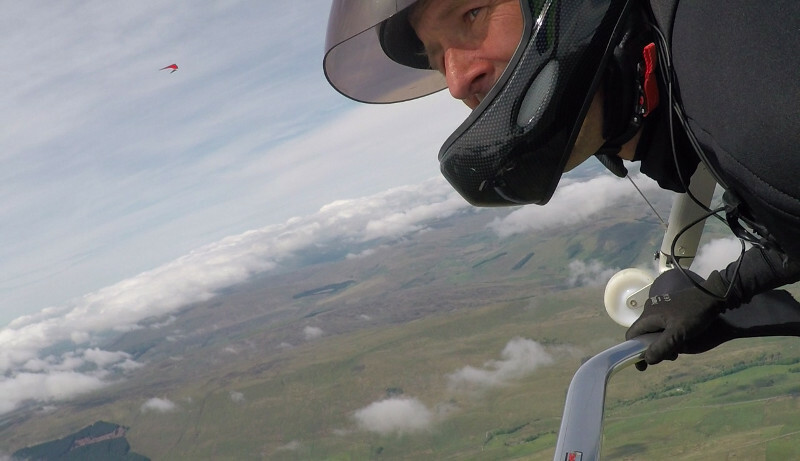 Searching for this device brought me to the Sailplane and Gliding archive which has recently been scanned into the internet and made searchable. 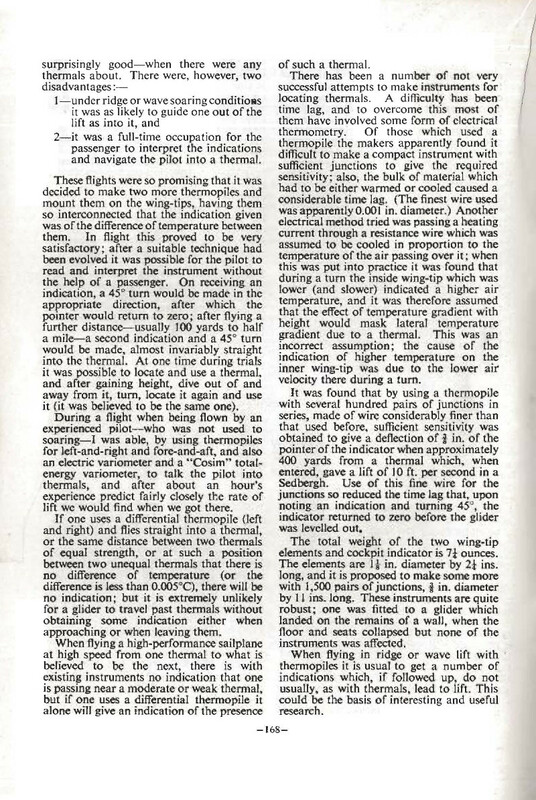 And lo, from Gliding magazing Winter 1954, after two days of randomly reading issues and finding much to laugh about, I hit paydirt in terms of identifying the first great attempt at detecting thermals by the temperature differential at the wingtips. 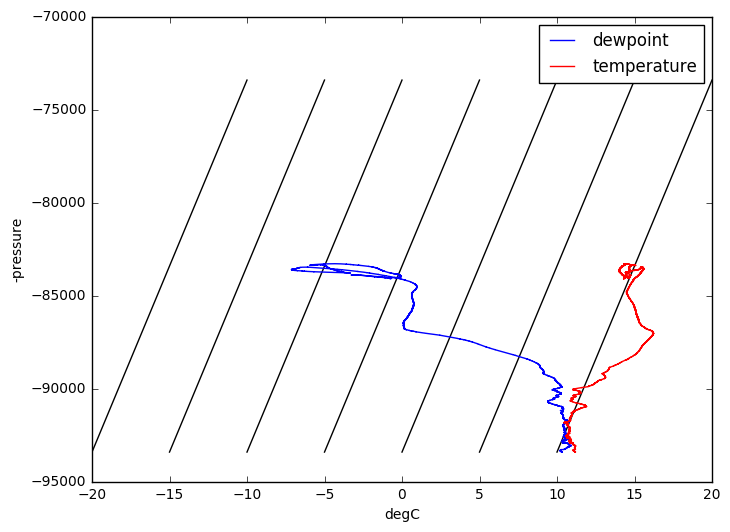 This is invariably the first idea one thinks of when you put together rudimentary knowledge of electronics and signal processing against the theory of getting to thermals when you are not very good at it. 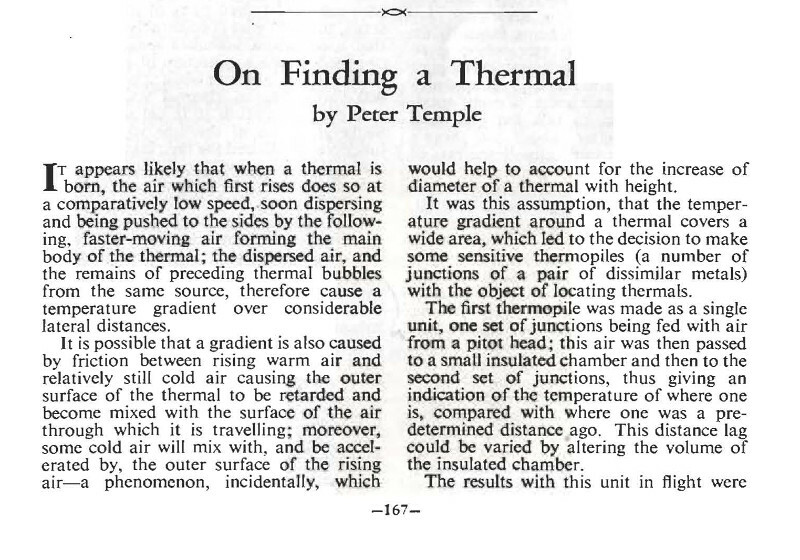 Here’s the crazy story: In 70 years of sensors, computers, and observations, we have gained no further instrumental understanding of thermal and wave flight than they already knew back in 1950 — as indicated by the articles I have read. Generally what happens is the pilot who is minded to do this sort of research development motivated by the potential assistance of such devices to his own flying, eventually develops the talent and skill to do it well enough without such devices, and gives up and goes off and has fun. It’s why a self-stabilizing bike has never been invented. The frustrated ten-year-old who keeps falling over as he’s learning, who is sure someone should invent a device to keep the bike balanced at all times, eventually just learns to ride a bike and quickly forgets the whole childish notion. Then, when he grows up and sees another frustrated ten-year-old in the same predicament, advises her in his infinite wisdom to not waste time thinking about such devices, because the solution will always come with practice, practice, practice. Except then nobody gets round to learning exactly why bikes stay up when you learn to ride them, and smart ten-year-olds are therefore doomed to take four days of busting themselves on the pavement as their unconscious mind slowly gets to grip with the situation instead of less than four hours were they to be explained the dynamics of the system so that they could start off doing it with a conscious insight. I mean, if someone is determined to make a self-stabilizing bike or a thermal detecting microcontroller device using the latest technology, everyone should encourage them, because they might find something out that we don’t know yet. And please don’t let me fly this close over wires ever again. It doesn’t look close, but I could tell that they were both green. My past propensity to glide into hedges when I thought I was going over them is giving me nightmares.